This summer has been so busy, and is flying by. I have barely had time to cook for myself, much less bake and blog about it. But last week I FINALLY had time. And it was glorious. Several of my friends were planning a beach day, and I sent them out the door with cinnamon rolls and baked my little heart away, all.day.long. What began with cinnamon rolls, turned into vanilla cupcakes with cookies and cream frosting followed by gluten free nutella cookies. Phew. My kitchen was busy. I made these cupcakes for a dinner we were having that was on the same week as three of my friends birthdays. Having to please 3 very different people with one birthday cupcake, and not making it boring- it took some brainstorming. 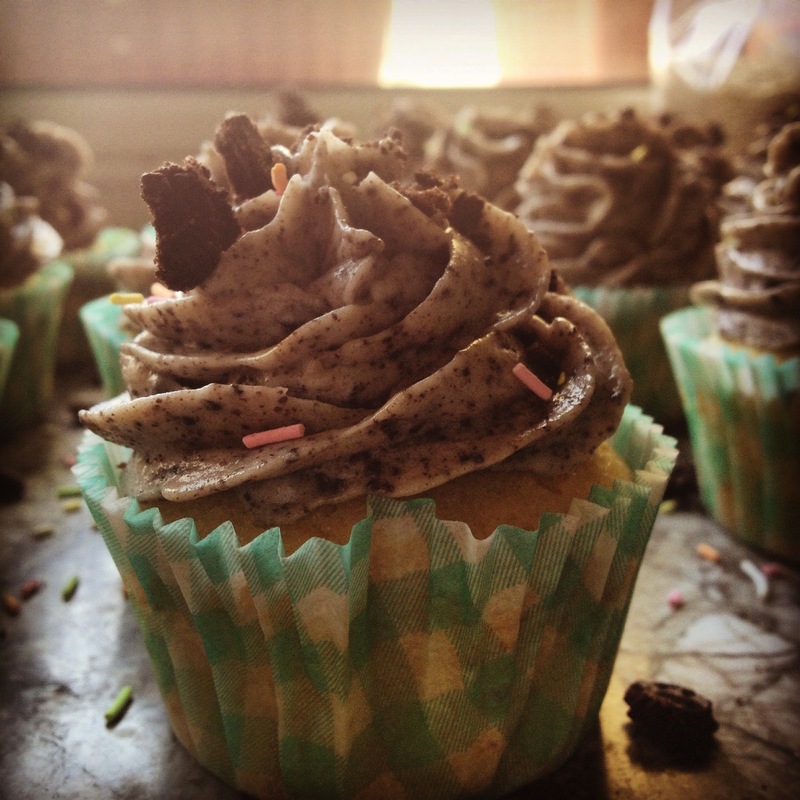 I knew I wanted to do a vanilla cupcake, after seeing this recipe, I NEEDED to try it. I mean, who doesn’t like smashed up cookies blended with butter and sugar. The recipe isn’t anything groundbreaking or super inventive. But it’s amazing. Thanks to my corner store (we call them Hanuts) being out of heavy cream, I replaced it with cream cheese. I love my hanut for forcing me to do this. It turned out so much better. Everyone loved this cupcake. Even those “I don’t really like cupcakes or sweets” friends. They haven’t stopped talking about it. And maybe I am renown for making too much frosting and having to freeze some for later. And maybe a few spoonfuls are gone. Don’t judge me. You would do it too. 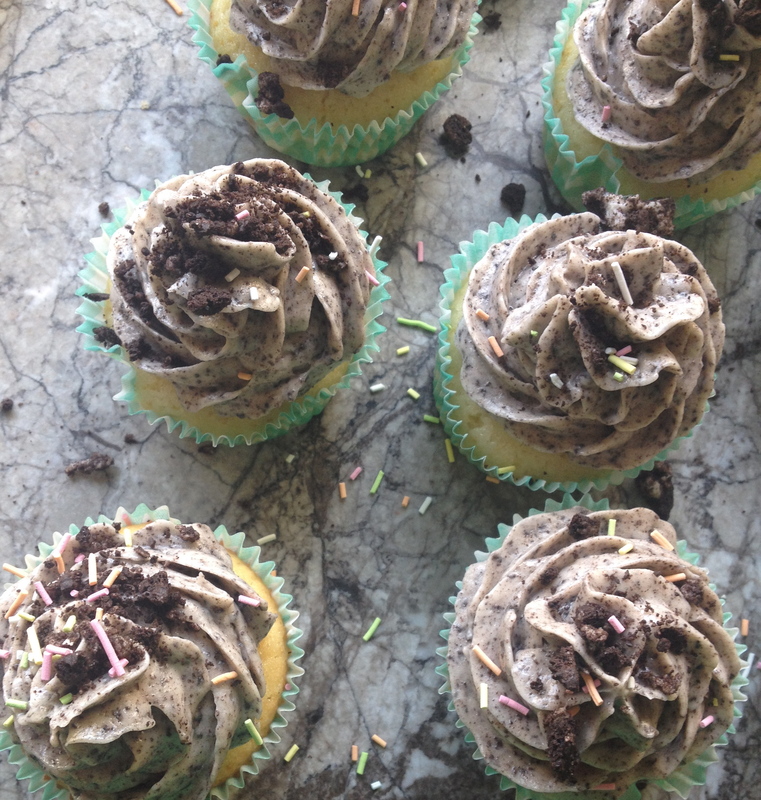 Treat yourself this weekend with these super easy cupcakes with cookies and cream frosting. *To get the perfect room temp butter and cream cheese, leave them out overnight the night before you plan on making the frosting. You can try microwaving them, for 10 seconds at a time, but you risk melting them, and that makes runny frosting. Overnight is best. Slowly add in powdered sugar, just until a thick, spreadable consistency. You may or may not need all 4 cups. Start with 1 cup and add just until you get to the consistency you like. Place the chocolate sandwich cookies in a food processor and process until the resemble large grains of sand. Do let it go too far, it will begin to become a paste. (if you don’t have a food processor, place in a plastic zip-top bag and crush with a heavy can or rolling pin) If you plan on piping the frosting, make sure the pieces are small enough to smoothly go through the piping tip. Fold in the cookie pieces until combined. Pipe or spread onto cooled cupcakes, or cake. This would also make a gorgeous layer cake topped with extra cookie crumbled.